Face Art Glitter Temporary Tattoos Instant Makeup-Gothic Punk Costume Makeup-PIRATE-Colorful Stick on Eye Wear Fake Tattoo Decals. Eye Shadow Sequin Decor Sticker Transfers. Special Effects Cosmetic Accessory, as pictured. Easy application and removal. Peel-and-Place, No water needed. 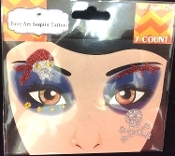 Gothic Punk Costume Makeup-PIRATE-Colorful Stick on Eye Wear Glitter Sequin Tattoo Decals with Classic Detail. Eye Shadow Face Art Sticker. Temporary Tattoos Transfers with Faux Rhinestone Gems Makeup Special Effects Cosmetic Accessory, as pictured. Easy application and removal. Peel-and-Place, no water needed! Your own makeup will make this glitter tattoo effect even more fabulous. *Warning: Avoid using glitter stickers on sensitive skin. Stickers apply easily, just peel and place, NO water needed. Simply remove with soap and water, baby oil or rubbing alcohol. ONE Tattoo Sheet per package, as pictured. Each sheet approx 3.25-inch (8.13cm) high x 5-inch (12.5cm) wide. Individual Tattoos vary in size between 1-inch (2.5cm) to 4.5-inch (11.25cm), depending on style. 1. Make sure skin surface is clean and dry. 2. Carefully peel the stickers off sheet by hand and place where you want to decorate, taking care not to touch the sticky surface of the tattoo. 3. To remove tattoo, wipe gently with soap and water, or use a soft cloth dipped in rubbing alcohol or baby oil. Sheet approx 3.25-inch (8.13cm) high x 5-inch (12.5cm) wide. *Caution: *Don't apply to sensitive skin, near eyes and lips, or if allergic to adhesive or listed ingredients.